Despite an inspired campaign by Sibiu’s supporters to achieve a Best City To Visit Championship first, Craiova’s solid victory marks another: Romania is the first country to ever win back to back tournament finals. Craiova was the second while Sibiu was the number one seed in the tournament and early on in the voting it seemed the 2013 champ was destined to bring me back for a return visit. 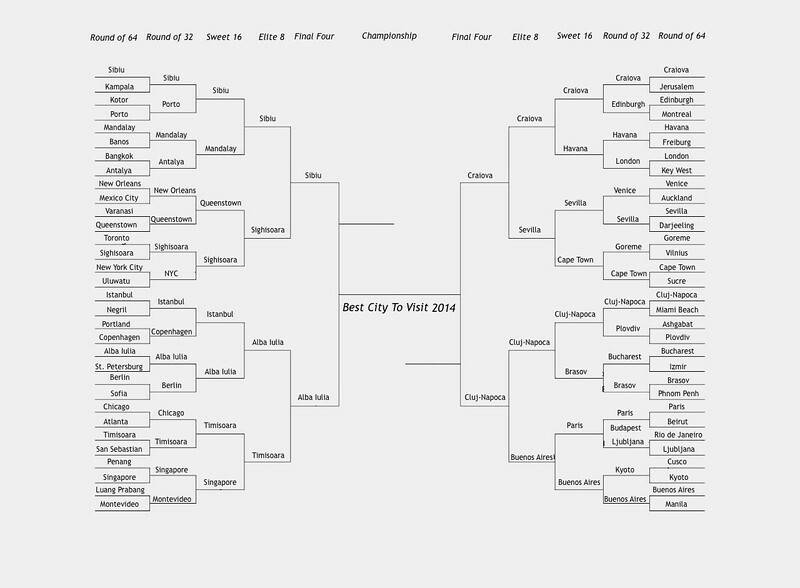 Congratulations to Craiova and Dana, who originally nominated the city in Romania’s southwest back in February. 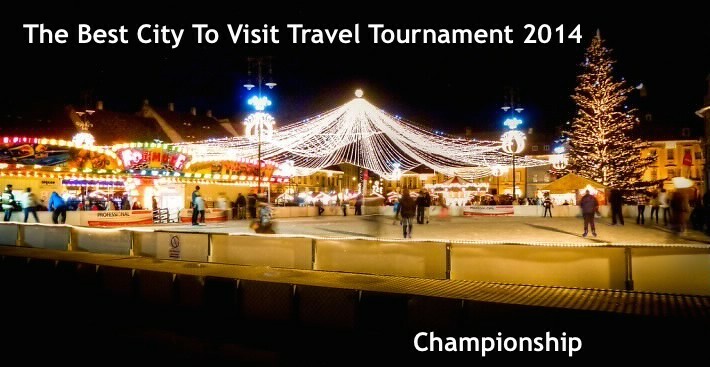 I’ll be taking your contest opinions in an upcoming post later this week but it seems the controversies from this year’s tournament have already motivated a few cities from different parts of the globe to begin their campaigns for 2015. I have received emails from a few large organizations who are looking forward to challenging cities from Romania and beyond in about 10 months from now. Take a moment to check out some of the companies who help keep me traveling, my server humming, and let me write whatever the hell I want in the meantime. Hotspot Shield VPN – Video not available in your country messages are not what you want to see when getting online in a new country. Hotspot Shield, my partner and recommended VPN service, solves that problem. Download for free today to show your support for a free Internet and foXnoMad. Keep Your Cooler – My partners like Keep Your Cooler let me me make travel plans to Kyrgyzstan while making sure my beer doesn’t get warm walking around Bishkek. 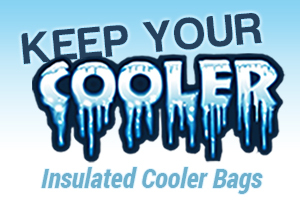 You can help support this hydrated nomad (and cold beer) by checking out their insulated travel bags at Keep Your Cooler.com. In the past due to my personal deficiency yet valuable travel asset of planning most trips last minute, I’ve visited winners of best city tournaments toward the end of the calendar year. This time however I’m aiming to break the pattern and visit Craiova during its warmer months. You can find my current travel plans on my upcoming stops page and I hope if you’re in Craiova that we can meet up while I’m there. I’ll organize something on my Facebook page and look forward to seeing Craiova and having drinks with its local supporters! 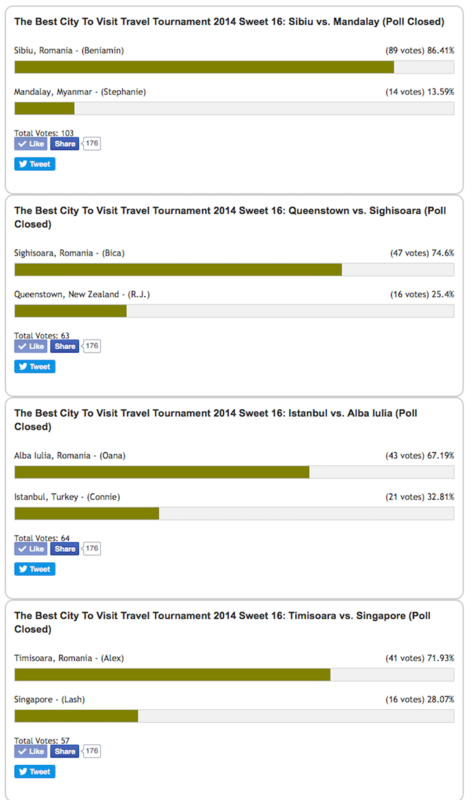 Thank you everyone who participated followed, and voted in The Best City To Visit Travel Tournament 2014. Your participation gives the contest its life and whatever path it takes is always a fun ride to watch. 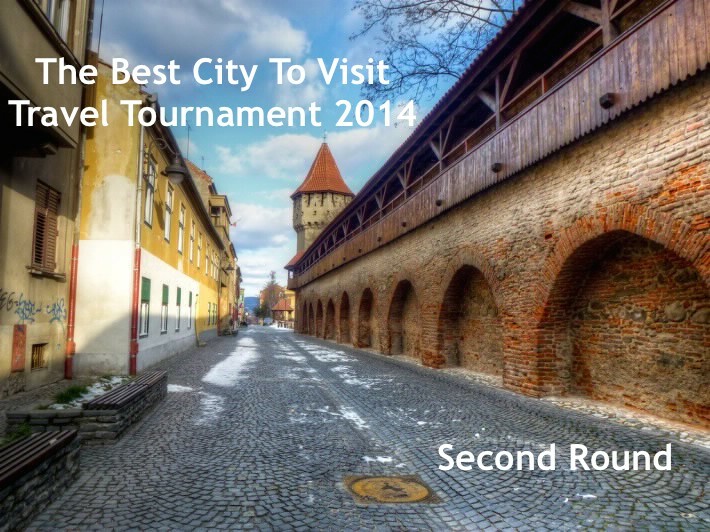 Congratulations again to all of the cities for being nominated and Craiova for being 2014’s Best City to Visit! The aftermath of a controversial all-Romanian Final Four leaves us with the potential of another first: a repeat champion city. Sibiu faces its southern rival Craiova, which got nearly 200 more total votes in the previous round. We’ll see if Craiova’s supporters can stop Sibiu in what I suspect will be a close and competitive vote. I look forward to watching the results that determine where in Romania I’ll be visiting later this year. Voting in the Championship will be open until 18:00pm US EST this Sunday, April 6th. Those of you reading through email and RSS will have to click-through to this page to vote. FINAL RESULTS won’t be announced until Tuesday, April 8th and current results will begin displaying later in the week. Good luck to both of the finalist cities! Love it or hate it, we now have an all-Romanian Final Four with Sibiu facing Alba Iulia, which narrowly escaped elimination with a tie-break. For those of you who are upset or think the tournament is broken because of Romania’s strong showing, here are my thoughts and response to the haters [NSFW: language]. 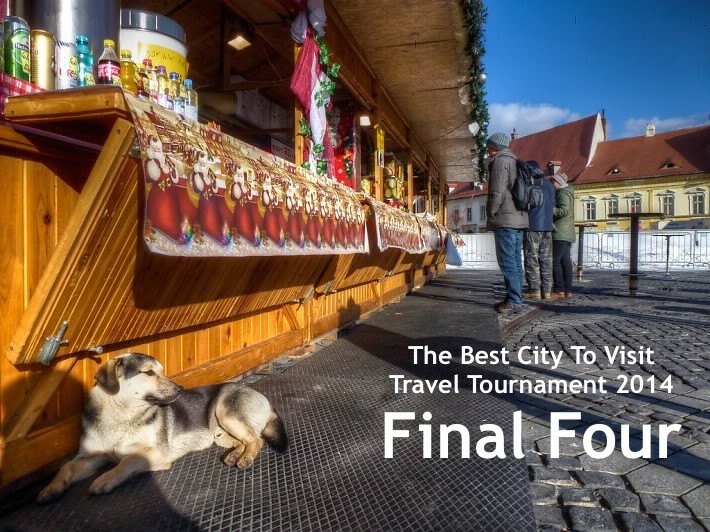 With that out of the way, let’s see this civil war of cities heat up and whether or not Sibiu can take one more step toward becoming the first repeat champion of The Best City To Visit Travel Tournament. Voting in the Final Four is open until Sunday, March 30th 6pm US EST to determine the two finalists in this year’s contest. Those of you reading through email and RSS will have to click-through to this page to vote. 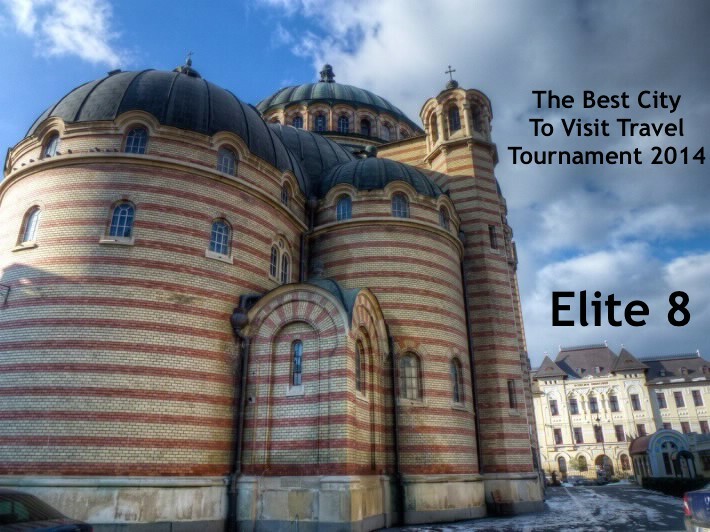 The Romanians cities are in full force for the Elite 8, having knocked off strong competition in the Sweet 16 last week. Now, Buenos Aires and Seville stand in the way of a Romanian Final Four. 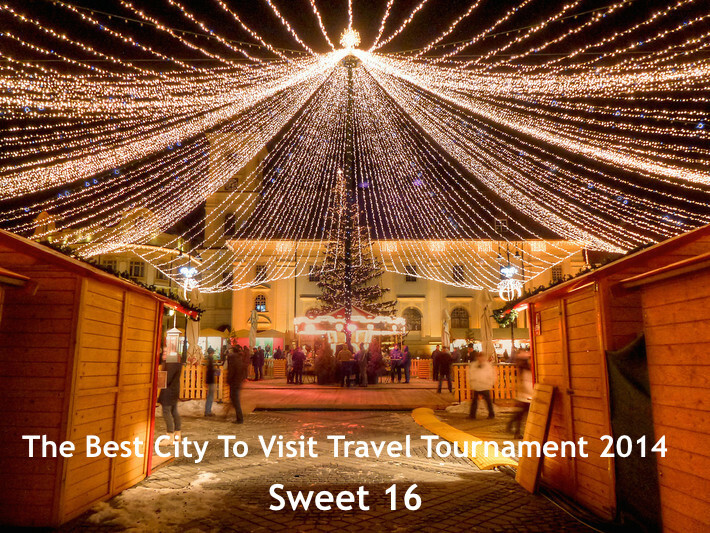 These 8 cities have all made it this far and each one is only a few steps from becoming The Best City to Visit of 2014; but if there’s one predictable thing about this tournament it’s that it is usually unpredictable. You have until this Saturday, March 22nd at 12pm US EST to pick your favorite 4 cities. Results will begin posting later in the week. Those of you reading through email and RSS will have to click-through to this page to vote. Good luck everyone and remember, the Final Four round begins next Tuesday, March 25th! This is one of the most interesting group of Sweet 16 cities I can remember in The Best City To Visit Travel Tournament. Over the next few days we’ll lose one more Romanian city between Cluj-Napoca versus Brasov and as the competition heats up, all of the entries can boost their support using these winning strategies from previous years. For the third round in a row I used my tie-breaking privilege to bump Havana over London while Paris jumped two entries, Budapest and Ljubjana in the Second Round’s modified match-ups. On the other side of the bracket, Istanbul has a good chance to knock off Alba Iulia and Cape Town could again quietly advance another round. Whatever happens though it will be all based on your votes! You have until this Sunday, March 16th at 12pm US EST to pick your favorite 8 cities. Best of luck to everyone! Those of you reading through email and RSS will have to click-through to this page to vote. Good luck everyone and remember, the Elite 8 round begins next Tuesday, March 18th! 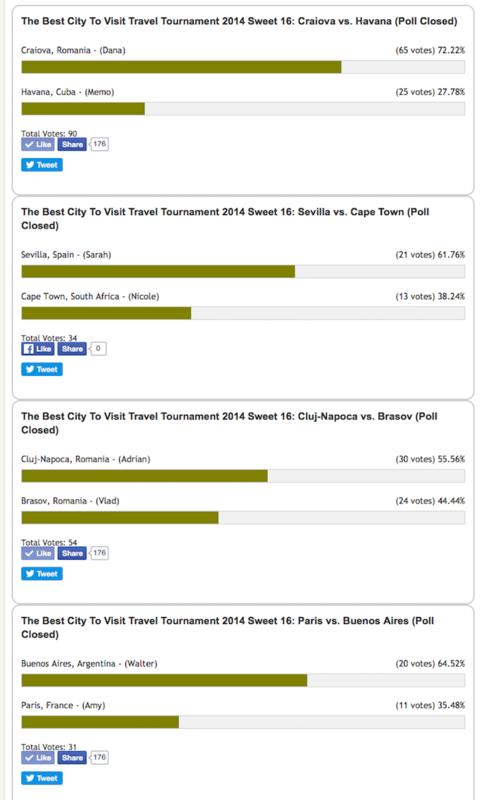 As has been the case in past Best City to Visit Tournaments, the First Round of voting produced some very close contests with a tie between Cape Town, South Africa and Surce, Boliva which I broke in favor of The Tavern of the Seas. All of the Romanian entries advanced but I won’t be able to say that at the start of the Sweet 16 on Thursday as Bucharest and Brasov face off today. Also, a number of you voiced your displeasure with having to enter a password in addition to the CAPTCHA on each poll so I’ve removed the first requirement – for now. I might have to reinstate it but in the meantime hopefully it’s less of a pain to vote. 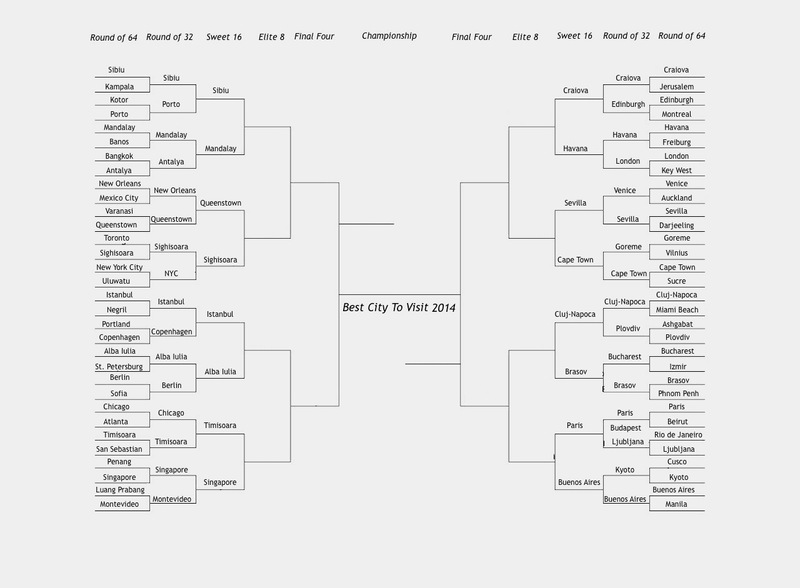 EDIT: It was bound to happen, I made a mistake in putting together the initial round and neglected to place Budapest in the Preliminary voting. To remedy the situation, I’m placing Budapest with a seed of the average votes in the Preliminaries, placing it in a 3-way race between Paris and Ljubljana. I apologize for the mistake – an unfortunate by-product of being human. 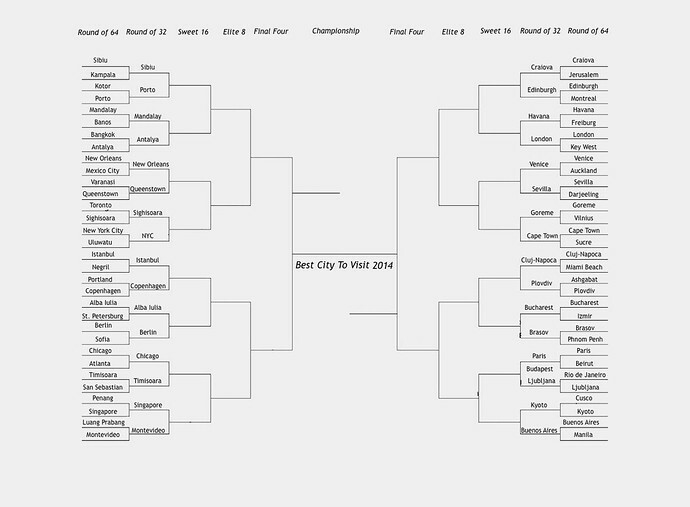 Remember, this Second Round of 32 cities ends tomorrow, March 12th at 6pm US EST. Results won’t appear until the round closes, when there will be only 16 cities left. Those of you reading through email and RSS will have to click-through to this page to vote. Good luck everyone and remember, the Sweet 16 round begins this Thursday, March 13th!